The streaky nature of the Bartlesville High baseball team has continued, as BHS has followed up its 10-game win streak with a four-game losing streak. Stillwater came from behind to beat the Bruins for the second straight evening on night. 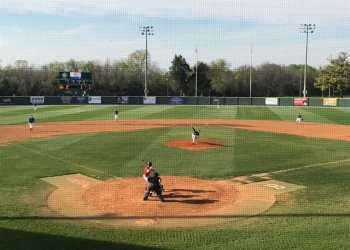 The Pioneers came away with a 9-5 victory, despite trailing Bartlesville 4-0 after the first inning. Bartlesville surrendered five runs in the top of the fourth inning that gave the Pioneers the lead for good. BHS committed four errors that led to four unearned Stillwater runs during the contest. Things looked good early. The Bruins had two separate rallies in the first inning, chasing Stillwater’s starter after one frame while scoring four runs. The big blast came off the bat of Braden Winters, who pounded a home run over the KWON sign in left center field. What should have been a three-run home run only accounted for two BHS runs, however, as Bartlesville had a base running miscue that cost them a run on the trot around the bases. That was unfortunately a sign of what was to come. BHS has now had losing streaks of seven and four sandwiched around a 10-game win streak in 2019. Bartlesville drops to 3-7 in district play and 11-11 overall. BHS heads to the Oklahoma City area for a tournament starting on Thursday. Bartlesville will play two double-headers on Thursday and Friday.